Found in FNA Volume 8. Treatment on page 167. Mentioned on page 149, 168. Shrubs [perennial herbs], not viviparous, [1–]7–10[–20] dm, glabrous or pubescent. Stems erect, branched [simple], woody or fleshy. Leaves persistent, crowded in rosettes at ends of branches, alternate, sessile, not connate basally; blade oblong-lanceolate or obovate, laminar to terete, 3–15 cm, fleshy, base not spurred, margins ciliate; veins not conspicuous. Inflorescences terminal cymes. Pedicels present. Flowers erect or spreading, [6–]7–12[–16]-merous; sepals connate basally, all alike; petals spreading or erect, distinct or nearly so, cream or bright yellow; calyx and corolla not circumscissile in fruit; nectaries mostly rectangular; stamens 2 times as many as sepals; filaments adnate on corolla base; pistils erect, distinct or nearly so; ovary base rounded; styles 2+ times shorter than ovary. Fruits erect. Seeds ellipsoidal, ribbed, finely cross-ribbed. x = 18. Introduced; Calif., Asia (Yemen), Africa, Atlantic Islands (especially Canary Islands). Species 31 (2 in the flora). Aeonium and the other polymerous-flowered Macaronesian Crassulaceae were formerly included in the polymerous-flowered Sempervivum. 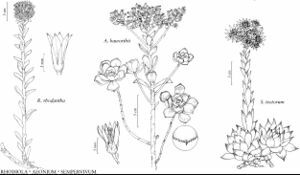 From studies in DNA and molecular systematics, T. H. M. Mes (1995) concluded that Aeonium and these related genera probably evolved from North African Sedum-like ancestors and are only more distantly related to Sempervivum. He thought that the wide range of growth-forms in Aeonium, including the woody habit, is derived from herbaceous ancestors. This page was last edited on 2 January 2019, at 22:28.